A lot of what I do both for myself and for my peers is hospital prevention. I would not feel such a pressing need to prevent hospitalizations if they were more ethical, therapeutic experiences AND if they were not so expensive. Even with insurance, expect to pay a few thousand dollars. "What is it that you get from the hospital that makes you want to go?" I asked someone a few days ago. The answer was, "attention." I go to the hospital because I want mental health attention too. With hospital prevention, it is important to realize the benefits of a hospital to see if you can get those same needs met in another way. One may or may not get adequate mental health attention in a hospital. One may or may not need more mental health attention AFTER the hospitalization because of post-hospital PTSD. First, realize that needing attention is not bad. People with physical health challenges need attention all the time and rarely get shamed for it. Figure out what kind of attention you need, and then go after it, unashamed. This is much easier to do with someone else's help. Make a WRAP plan! WRAP stands for Wellness Recovery Action Plan and is where you make a plan of how you will stay well, and also how you will handle every bump in your recovery journey. You detail what a crisis looks like for you and then you write down what YOU want to happen, so that a crisis will not be worse than it needs to be. "Take me here, not there... Give me this, not that..." I am currently rewriting my own. A certified peer specialist can help you make one (we have a WRAP activity where I work every Thursday) or you can create it yourself or with your therapist. I had a conversation with someone else who kept saying that they would rather sleep outside than in a shelter-a sentiment I've heard before. People long for peace and safe spaces, especially in early recovery, especially after just getting discharged from a chaotic hospital. I know a fair amount of people who have opted to sleep in an alleyway rather than the triggers of a shelter. It's funny-in a sad way-how hospitals and shelters are not peaceful places-people would get better so much faster if deescalation and validation techniques were used instead of yelling and slamming doors. I was filled with so much emotion when I got home that I wrote several poems. The end of the first poem spells LOVE, which is what we follow on the warmline - Listen, ask Open ended questions, Validate, and Empathize. The poems are a little cheesy, but they're a good representation of what I do and how I feel about my work. It is natural to want and need attention. Attention seeking is not inherently bad. The hospital offers no warm embrace. Let us be each other’s grace. Replace the "I" with "we"
Than those wearing the savior mask in disguise. You call it a shelter, but at night my heart cries. I follow peer love, not fear. I also recently completed a NAMI "End The Silence" program, which is a presentation for teens, parents, and teachers about mental health awareness and suicide prevention. I thought I'd share a few bits from the application. What is it about your (or your family member’s) experience that you think the students, teachers, and/or families will be able to relate to? I struggled as a teen and young adult with my mental health challenges. (eating disorder, suicidal thoughts, anxiety, depression) I still remember what that was like. I had to live with my parents for a while and thought life was passing me by. Learning DBT and getting the right support changed my life. Now I am a certified peer specialist working at the Decatur Peer Support and Wellness Center and I have a good life. Also, I go to DragonCon and cosplay every year and everyone gets a kick out of seeing my pictures-you can have a mental health challenge and still enjoy life and have fun. Recovery is being able to live a life filled with hope and promise even with a mental health or addictive disease challenge. It is focused on strengths and wellness; it is self determined; it promotes hope and continued opportunities in life no matter what. Treatment works as long as the person has access to it and is open to working hard. It needs to be recovery, hope, and strength based. It should acknowledge the impact of trauma, be holistic and self directed. Currently, evidence based treatment can be very hard to afford and find. Mental hospitals are essentially mental health prisons and do not promote recovery. There is chronic underfunding, understaffing and under training in hospital and general mental health settings. Fortunately, Georgia is number one in the nation for peer support. The free opportunities available for peer support (NAMI, GMHCN, Wellness Centers, RCOs) should be more widely promoted. Peer support should be recognized as an essential adjunct to standard medical model treatment. Treatment should always be hope and strength based, so it can be part of the solution and not part of the problem. 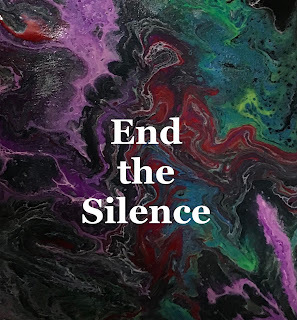 Contact me to schedule an End The Silence presentation to let teens, families, and youth workers know that hope is real for a better life, no matter how young a person may be or how dire the situation seems in the present moment.